Established in 1991, AJ Press of Poland publishes books apprpriate for both history buffs and modellers alike. The Modelmania series provides a wealth of information on specific aircraft types. The latest in the series is Modelmania 7 - Focke-Wulf Fw 190 D.
This new title starts with development and historical background, including a description of the variants. This includes black and white contemporary photos of the aircraft under development and in service. 15 pages of 1/48 scale plans and scrap illustrations, including useful cross-sectional views are then offered. The operational record is covered next. Pages 44 to 68 are packed with large, attractive profiles of a wide variety of Doras. Most are single side profiles, but there are a number of plan views plus a comprehensive stencil guide over five pages. This is followed by colour walkaround photos of museum examples, interspersed with helpful drawings from the original maintenance manual of various specific aspects of the aircraft. The book is rounded out with a detailed description of building Trumpeter's big 1/24 scale Dora, illustrated amply with colour photos of the model under construction and completed. 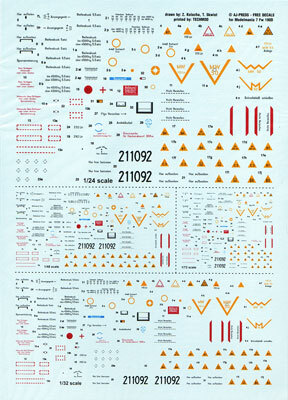 A list of available kits in all scales is supplied on the inside back cover. Text is in both English and Polish. A comprehensive set of stencil decals is included. These are in 1/72, 1/48, 1/32 and 1/24 scales. The decals are printed by Techmod. Colours look good and registration is perfect. 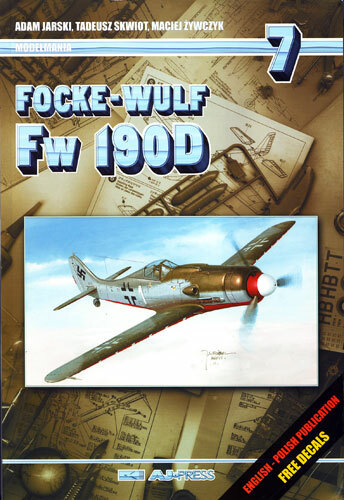 If you do not have a lot of reference on the Focke-Wulf Fw 190 D-9, AJ Press's Modelmania title will be a very helpful one-stop shop for modellers. Thanks to Air Connection for the review sample.